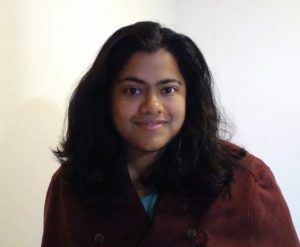 The relevance of Tanushree Mitra’s research and its socio-psychological aspect attracted Shruti Phadke to the Discovery Analytics Center in Fall 2017 while she was earning a master’s degree in computer science at Virginia Tech. “I have always been inclined to work in interdisciplinary fields so the opportunity to work with Dr. Mitra seemed like a perfect fit for me,” said Phadke. Phadke studies the social influence of hate groups and conspiracy communities on social media. At present, she is analyzing language used by hate groups (like neo-Nazis, anti-LGBT, anti-Muslim, and white supremacists) on Twitter representing ideologies that affect democratic values of society. She is also studying communities like Reddit Conspiracy (r/conspiracy) that cause panic and spread mistrust in organizations. “From looking at even just a few of the messages posted by hate groups and conspirators, it is easy to understand how manipulative and influential such communication can be to their targeted audience,” said Phadke. Currently, natural language processing (NLP) and network analysis tools are not sophisticated enough to understand such complex context of hate and propaganda, she said. “We have to take inspiration from sociology and psychology regarding community behavior, propaganda, and influence. The multidisciplinary nature of the research I am doing attracts me the most,” Phadke said. Phadke is at the 2018 ACM Conference on Computer-Supported Cooperative Work and Social Computing in New York City this week to present the poster, Framing Hate with Hate Frames: Designing the Codebook. In their research, Phadke and her coauthors — who include Mitra and James Lawdon, a Virginia Tech sociology professor — offer a two-fold outlook on hateful social media communications. First, they adopt a collective action perspective to analyze how hate groups identify problems in the social groups they target, suggest solutions to the problems, and motivate their supporters. Then, the researchers develop a codebook highlighting strategies of influence through the lens of propaganda devices. Phadke is also serving as a student volunteer for the conference. She is projected to receive her Ph.D. in 2022. “Ideally, I would like to work for a journalism organization that computationally studies policies and deviance in an online world,” Phadke said.